Americans are falling short when it comes saving money — specifically, setting aside money in savings accounts — to create a financial cushion. In fact, they’ve gone from bad to worse, according to GoBankingRates’ latest survey findings on savings amounts. 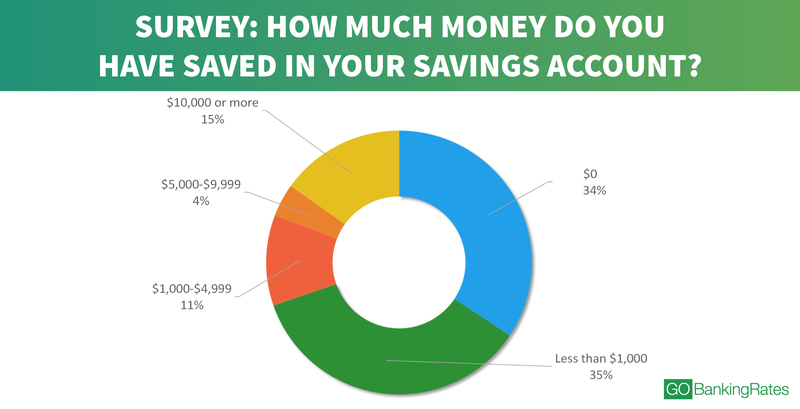 In 2015, we asked more than 5,000 adults how much they had saved in a savings account. The results were startling: 62 percent said they have less than $1,000 in savings. Recently, GoBankingRates asked the question again, this time to more than 7,000 people to see if Americans’ saving rates have improved in the last year or so. But the results are even more surprising — the percentage of Americans with less than $1,000 in savings has jumped to 69 percent. Not only has the percentage of people with little money in savings accounts grown, but so has the percentage with absolutely nothing in a savings account. In last year’s survey, 28 percent of respondents said they have $0 saved. Now, 34 percent say they have no savings. One of the big reasons people aren’t saving more is likely because they are living beyond their means. “It doesn’t matter if they are making $30,000 per year or $300,000 — people don’t seem to know how to spend less than they make,” said Hardy. Plus, credit cards and other cashless payment options such as Apple Pay have made it even easier to spend, added Brandon Hayes, a CFP and vice president of oXYGen Financial. Based on the survey findings, though, there are some Americans who appear to be making saving money a priority. Of those surveyed, 15 percent have $10,000 more in a savings account, versus 14 percent in 2015. 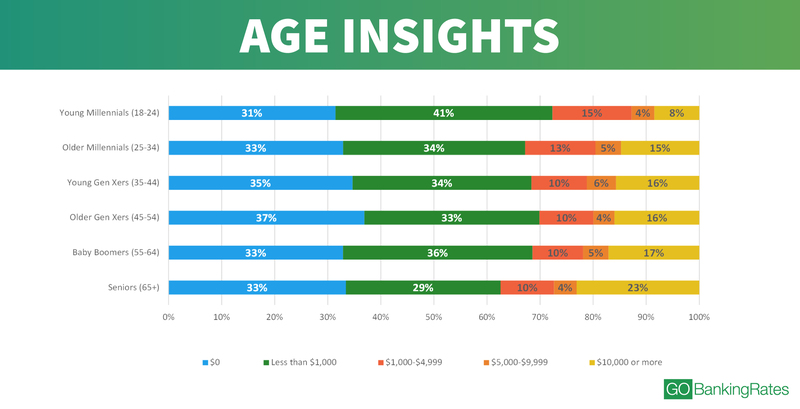 And although older Americans are more likely to have bigger savings account balances, there are respondents in all age groups with thousands in savings. Seniors ages 65 and up are the most likely age group to have more money in their savings accounts. Of those surveyed, 37 percent have $1,000 or more set aside. 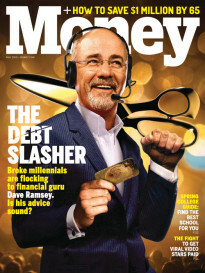 On the other hand, only 27 percent of young millennials (ages 18 to 24) have $1,000 or more in savings. Overspending might play a role in young adults’ low savings rate. A survey by TD Ameritrade found more than nine in 10 millennials overspend, fall short on savings or take on additional debt at least once a month per year. One reason could be because they feel pressured to develop certain spending habits. For example, the survey found 52 percent of millennials feel pressure to keep up with their friends due to always going out, and 46 percent feel the pressure because of social media posts. However, older millennials (ages 25 to 34) seem to be doing a better job of saving money than younger millennials and even Gen Xers (ages 45 to 54). The GOBankingRates survey found a greater percentage of older millennials have $1,000 or more saved than older Gen Xers ages 45 to 54 — 33 percent versus 30 percent. Gen Xers might have less money in savings accounts because they have more demands on their budgets and are prioritizing other types of savings. “Many people save too much for things like retirement, college savings or investments and squeeze themselves too tightly financially, leaving little room for spending or building of their emergency fund,” said Hardy. Women are more likely than men to have nothing set aside in savings. Forty-two percent of women have $0 set aside in a savings account, compared with only 28 percent of men, the survey found. But, an almost equal percentage of women and men — 35 percent and 36 percent, respectively — have less than $1,000 saved. Still, men are more likely to have more than $10,000 in savings. These findings mirror the results found in a recent GoBankingRates survey that examined retirement savings, specifically. According to the survey, women are less prepared for retirement than men — 38 percent of women said they don’t have retirement savings compared with only 30 percent than men. Furthermore, only 9 percent of women have $300,000 or more saved for retirement, while 16 percent of men have $300,000 or more. 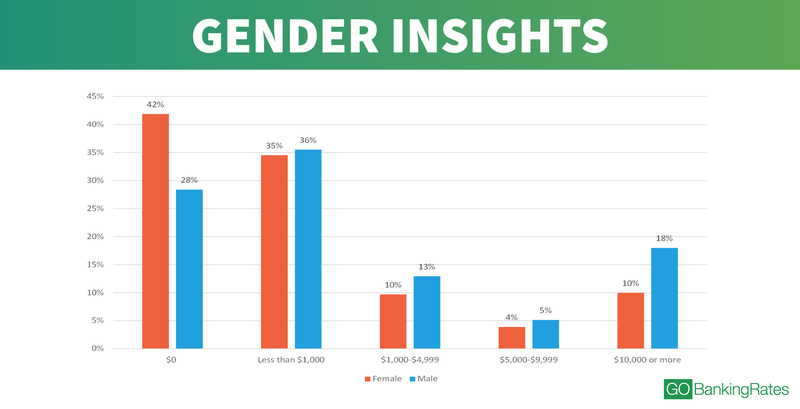 Income might play a role in the difference between men and women’s savings rates. According to the American Association of University Women, women working full time in 2014 were paid 79 percent of what men were paid. Interestingly, the gender pay gap seems to widen as women age. A 2012 AAUW analysis found that women earned 82 percent of what their male counterparts made a year after graduating college. But 10 years after graduating, women earned only 69 percent of what men were paid, found a 2007 AAUW report. 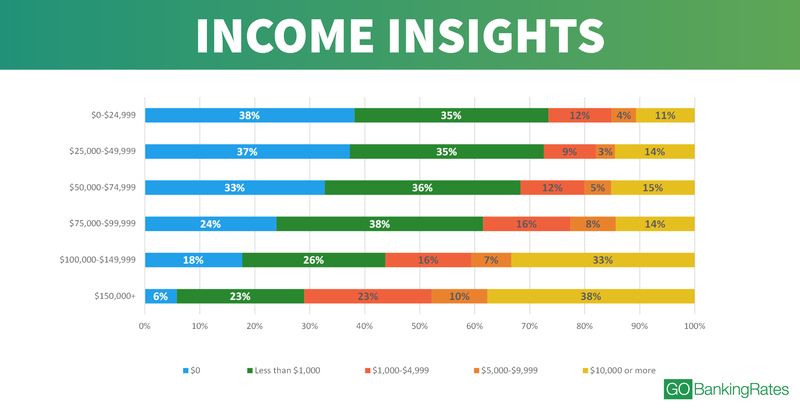 The GOBankingRates survey found that lower-income adults are the least likely to have money in savings. Of those earning less than $25,000, 38 percent have $0 in savings and another 35 percent have less than $1,000 saved. The percentages are nearly identical for those earning $25,000 to $49,999. In contrast, just 6 percent of respondents with incomes of $150,000 or higher have nothing in savings, and only 23 percent have less than $1,000 saved. And, nearly 40 percent of those in that income bracket said they have $10,000 or more in savings. It makes sense why saving money is harder for people with smaller incomes, especially if the cost of living is high in their city. 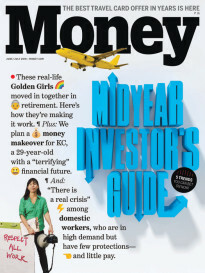 In fact, depending on your city, you’ll need a larger income to live comfortably, found a recent GOBankingRates study. Many people use the 50-30-20 budgeting rule to budget their paycheck. Using this method, half of your paycheck should cover your necessities, 30 percent should go to discretionary purchases and 20 percent should go toward savings. Now, let’s say you live in a city like Los Angeles where you need to make about $74,000 a year live comfortably. That means you would need to save almost $15,000 throughout the year. But what if you make only $40,000? Living in LA — or any expensive city — would make it hard to stash away $10,000 in a savings account — and nearly impossible to save $15,000. Financial planners typically recommend having enough in savings accounts to cover three to six months’ worth of expenses. To reach that goal, you’ll need to make saving money a habit. Start by determining your savings potential — how much you can set aside each month, said Hayes. Examine your spending to see how much is left over after covering essential expenses and what can be cut. Luber suggested making a list of the top 10 things you tend to spend money on in a given month and ranking them in order from which makes you the most to least happiest. “Cut those bottom three items out entirely, and put part of this money into an emergency savings account,” she said. Hayes recommended opening a savings account at a bank other than the one where you have your checking account so it won’t be too easy to raid your savings for non-emergencies. If possible, look for a high-interest savings account that can help your money accumulate faster. You can even open multiple savings accounts for different goals. Just remember: The higher the savings account rates, the faster your small balance will grow into a bigger one. Next, set up automatic weekly or monthly transfers from your checking to savings. As your income increases, so should the amount you’re setting aside in savings, added Luber. You can add a layer of accountability by working with a financial planner, said Hayes. Or, use a financial management app such as Mint, or software such as Quicken, to keep track of where your money is going. If necessary, you can put saving for retirement or other goals on hold temporarily to funnel that money into an adequate emergency fund, said Hardy. “It sure does feel good to know that if something happens, you have the cash or don’t have to liquidate your retirement account,” he added. Methodology: This GoBankingRates survey posed the question, “How much money do you have saved in your savings account?” to 7,052 people among all 50 states and Washington, DC. Responses were collected through a Google Consumer Survey conducted from Aug. 1, 2016, to Aug. 9, 2016, and responses are representative of the U.S. online population. The survey has a 2.6 percent margin of error.